Hey guys. Guess what. I just posted these over on Yammie's Noshery and I just realized that they're actually gluten free. You're welcome. In a medium mixing bowl, mix together the gelatin, extracts, coconut milk, and salt. Let this rest while you cook the sugar. In a saucepan, combine the sugar, water, and corn syrup. Cook over about medium high heat, stirring occasionally until it reaches 238ºF. Pour the hot syrup into the gelatin mixture as you beat it. Beat for about 10 minutes. Pour into greased 8x8 inch pan (it will be very sticky, so don't worry about scraping the bowl unless you want spiderwebs of marshmallow all over your life). Allow to set until firm (maybe about an hour or something). Cut into squares (or cut with small cookie cutters) and toss in a little more powdered sugar. 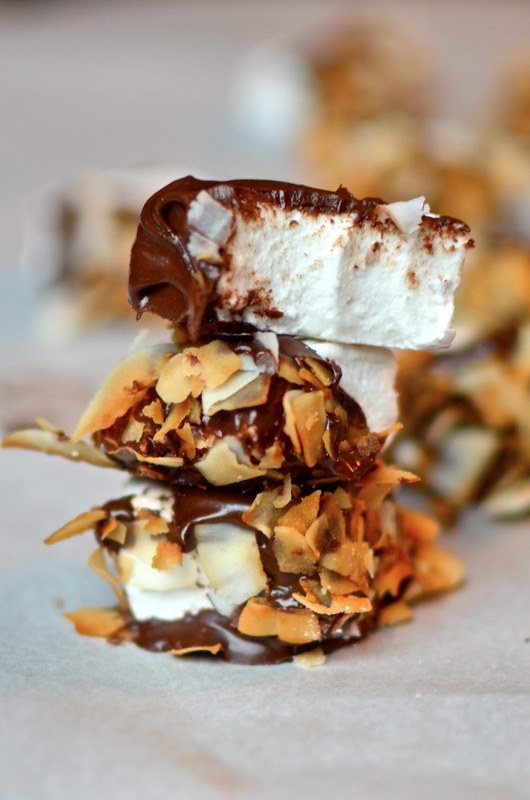 Dip in melted chocolate and toasted coconut if you want.